Over the years I've struggled with boot pain, and not just ski boots but snowboard boots as well. You would have thought that snowboard boots would be far more comfortable compared to ski boots but that is not necessarily the case if you're unfortunate enough to have oddly shaped feet or posture issues. The above is also compounded when you start to hike, and tour in the mountains, in much the same way as in when running and walking longer distances in running shoes and/or hiking boots. If you have a problem then your feet will let you know through a myriad of issues, such as blisters, more on those here. The human foot is a strong and complex mechanical structure containing 26 bones, 33 joints (20 of which are actively articulated), and more than a hundred muscles, tendons, and ligaments, so no wonder you can have problems! For most recreational skiers on their one week holiday, they will often tolerate the pain associated with badly fitting boots, or if they have hired boots, they then might well be able to change the boot. For those that have bought their boots, and they are suffering, many are not willing to go to the added expense of seeking out a solution, nor possibly do they have the necessary time in the resort. And being cynical I have seen first-hand, members of my own family buying boots back in the UK, and almost like a salesperson from Currys trying to force you to take out a 5-year insurance plan, the "boot fitter" going to extreme lengths to sell you customised insoles (orthotics) without any thorough examination of your feet, let alone posture. Back in the days when I ran marathons and was obviously doing a lot of running (road) I suffered from a number of issues and some thirty years ago remember going to a running specialist for gait analysis, nowadays you can download an app. The prognosis-diagnosis was based on you running on a treadmill and being videoed from behind with various laser beams set up along with a thorough examination of your body and posture, as well as the all-important feet. In my case, I had one leg shorter than the other, to the tune of 2.5cms, and 70% of people who have issues with their feet do indeed have one leg shorter than the other! Sound posture/feet analysis goes a long way to determining the issues. The problems are not just related to pain with their feet but manifests in hip and back pain due to poor posture alignment. The solution for me was to actually have one running shoe built up with an extra 12mm sole, as well as prescribed orthotics. And so back then new words were added to my sporting vocabulary, pronation-supination and orthotics. I was wise enough to swap my new expensive orthotics into my snowboard boots, but I'd still endure pain in many a trip to come, in my case, my ankle bone. Over the years I've had three or four pairs of orthotics and have transferred to various ski boots, and even with thermo molded liners my ankle bone still was uncomfortable. I had even gone to one "boot fitter" in the valley and he modified my orthotics, but again no real change. Things literally came to a head a couple of years ago, when I was doing a hut to hut ski tour in the Mercantour (Southern Alps) to Nice. The final night in the hut my ankle was inflamed and really painful, I had put a compeed on my ankle bone to help with the pressure point, however, the small fluid-filled sac that cushions and lubricates the ankle bone, the bursa had become infected. I hobbled into a pharmacy in Nice and showed them my ankle, and they immediately arranged for me to see the Doctor upstairs, who basically said another day and I might have lost my leg or worse, and that I was to go to a hospital for an X-Ray to be sure the infection was not spreading beyond my ankle. So there I was in March with still two months of the season to go and a massive green hole in my ankle and the ankle bone resembling a ping pong ball. I'm not going to post the photo as it is pretty disgusting, but along with numerous antibiotics and pain killers, I was now on a mission to sort my ankle issues out once and for all. I had heard mention of the "Boot Doctor" in Briancon, as some good friends had been treated by him, one a guide, who'd been experiencing serious problems with his feet. So off I went to see him, and fortunately he was able to "deal" with me there and then, but usually, as he is so busy you do have to make an appointment. As soon as I took my sock he could see what the issue was and I explained how I'd been touring for five days and the subsequent Vesuvius eruption that had occurred. What was immediately apparent to me, was how much more clinical and technical this boot doctor was compared to others that I had seen in the past, especially during my running days. Benoit took me down to his clinical assessment room and did a thorough examination, and basically was happy with the orthotics that I was using. He then said he was going to modify my boots and liner and to come back in a few days. Now bearing in mind my ankle injury was only a couple of weeks old, and still pretty tender (I'd be on antibiotics for another three months), I was able to put my boot on without too much pain. Benoit had blown my boot out to what looked like the equivalent of a tennis ball, both shell and liner. And I was able to ski without too much discomfort (wound was still dressed daily) to the end of the season and all through the next without any more issues. This year I went back to see Benoit as I was starting to have a problem with a bunion on the big toe joint, and again a simple modification to the boot and all was good. This time I spent more time with Benoit as I do find it a fascinating subject, and asked him a series of questions. He's fully qualified as an Orthopedist, Podiatrist and Orthotist qualifying back in 2011 and practising in Briancon for the past six years, and aged 46 he's also a ski Instructor as well as a Mountain Bike and Kayak guide. The majority of his clients as one would expect are those that spend a lot of time in ski boots. 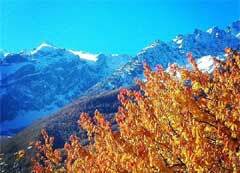 Ski instructors, pisteurs and mountain guides, as well as hospital/medical referees. His client base is 60% sporting and 40% medical, and breaking those numbers down further. As well as mountain biking and running (trail) making up the rest. The main age demographic is 35-50. What is fascinating is that 70% of his clients do have one leg shorter than the other, pronators (flat feet) 50% and supinators (high arches) 30%. However, the biggest issue is that of poor posture 80%, which is not helped by one leg shorter than the other! And then just as serious are bone problems, with bunions accounting for 70% and nigh on an equal split between heel spurs and toes. 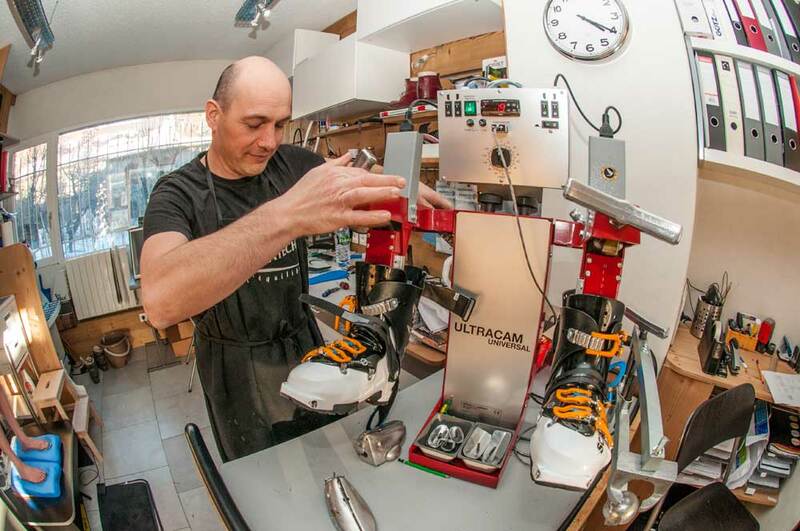 Ninety percent of ski boot/foot issues can be corrected with good custom made orthotics. These are not to be confused with heat moulded inner soles which many a ski shop will suggest/provide when buying new boots, which while initially may seem to work, they will eventually break down and lose their all-important shape. Custom orthotics are rigid and will often have additional material supporting the arch from collapsing. The all-important molding stage, which many shops do offer, as below with Benoit. However, it is the actual production and fine tuning of the custom orthotic where a specialised boot doctor such as Benoit will not only have the right equipment but the skills, experience and knowledge to produce the custom orthotic. And along with making the orthotics Benoit has a number of machines for stretching and blowing out both shell and liners, such as the Ultracam Boot Stretcher. And Benoit also is a firm advocate of yoga and stretching, as so many issues relating to feet are in turn effected by posture, which is something many of us do indeed know but fail to do anything about..